Kindle loves this project because... Well, Kimi is not a project, she's a person, and a member of our valiant Steering Committee. However, she is a contemporary renaissance woman with her hands, brain and expertise involved in many, many projects that we admire. She's a Jane of All Trades and a master of them all. With sharp entrepreneurial intuition, a heart as big and committed towards animal rights as it is to personal growth and environmental justice, Kimi is a friend, a leader, an innovator and we have always looked up to her, in awe of all that she is. Kindle is lucky to have her as a part of our crew. 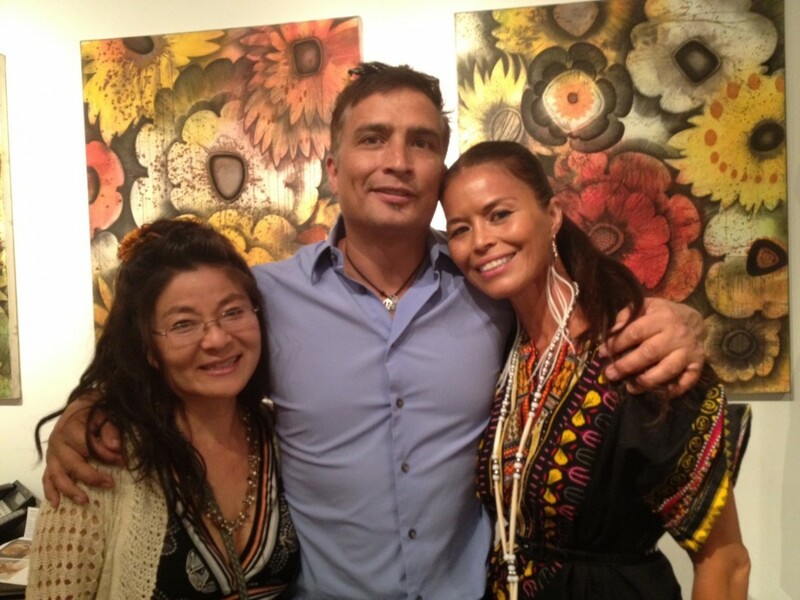 Kimi (on left) with Tony Abeyta and Rulan Tangen of Dancing Earth. What do you see as the greatest challenge your community is facing? In a community rich with indigenous, traditional and creative culture, we remain challenged with equity issues regarding natural resources and economic sustainability. What is the strongest asset of your community? The cultural and creative diversity and courageous community members and leaders who work tirelessly to impact positive change and transformation despite economic and financial limits. Volunteerism is widespread and there is tremendous good will from individuals and groups who want to make a positive difference. Who are your real-life heroes in your field? It’s epic how many people I see as real-life heroes! Wangari Maathai, whose vision and courageous work empowered those in poverty to become part of a vibrant, powerful grassroots movement for environmental, economic and gender equity in Kenya, deeply inspires me. When and where did you feel most fulfilled in your work? When I am working directly with the people and community being impacted, I am so moved by the individual acts of courage and commitment on a day to day level that makes a difference. Single mothers, who despite all odds, give their heart and soul to their family and community always touch me deeply. What is the trait you most deplore of your field? Approaching issues with a top down model about metrics only and not the quality of change. Grassroots represent transformation from the ground up and yet have to work twice as hard to secure support, if ever, from bureaucracy based institutions. What is one thing you wish the general public knew about your work? I have always been guided by Margaret Mead’s statement “Never doubt that a small group of thoughtful, committed citizens can change the world; indeed, it’s the only thing that ever has.” I believe diverse and united vision and action are at the core of transformational change for the whole. If funding were no object, what would you do? I love all that I do and I would also like to work more directly with grassroots movements. I am inspired by the innovative, diverse and people based approach such movements bring to empowering positive change. What’s your favourite way to procrastinate at work? Reading articles about late breaking world news, innovations in technology, design and health, and updates in art, music and film. When I am in a work “rut” it helps reignite my passion for the world we live in. If you weren’t doing this kind of work, what would you be doing? I would be studying how dolphins do grassroots movements! I am deeply touched by the simple daily interactions with profound people who despite all odds are creating change. It reminds me we are all capable of transforming within and being powerful catalysts for change and transformation. Tony Abeyta, Award winning Navajo artist and close friend. I have watched Tony’s work evolve to mastery over 25 years and I am always in awe of his creative muse. It is too hard to choose one song, but Hugh Makasela is one of my favorite musicians. He is a world class musician who is also a committed humanitarian for political change. I have been blessed to see him in concert numerous times and he inspires his audiences to tears. The Dalai Lama is one of the most remarkable, compassionate and tireless activist for world peace. It was a blessing to work with him and his down to earth, deep love for humanity and all beings joined by a great sense of humor and the ability to bring out the best in people, always inspired me that world peace was possible. Martin Luther King, Jr is the person who inspired me most since childhood. His courage, commitment to non-violence and the vision that true freedom is based on the fundamental truth we are all created equal have powerfully shaped my life. New Mexico green chili chicken enchilada with fresh roasted green chili’s from Hatch, NM. Yummiest local food ever! If you could give $10,000 to any organization besides your own, which would it be and why? New Mexico Environmental Law Center would be my choice because they are tireless legal defenders for communities facing water, air and land degradation and they provide legal support for many non-profit organizations and grassroots movements throughout the Southwest. I rarely lie…am a very poor liar and am usually busted too. I am far more likely to omit information or an opinion rather than lie. What do you think is the greatest social issue of our time? The lack of gender, economic and natural resources equity is staggering and tragically, the inequity is growing. How we resolve this social chasm without significant violence and with ingenuity is an equally profound issue facing humanity. What do you think is the greatest environmental issue of our time? Climate Change will change our world and how we are able to respond will change our outcome as a species. How do you think we can change the world? Personal awareness and daily choices, engagement with our community and networks for change, practicing compassion, bringing commitment and courage to challenges and most of all, I feel being love transforms everything you are doing. What’s your favourite online resource for news? What’s your favourite online resource for fun? When I am reminded that true beauty surrounds us in a sunset, my son’s laughter, a stranger’s smile, a bird’s lyrical song, a mother’s tears…whenever I feel total love of the moment. Kimi Green is a nonprofit consultant working with organizations, foundations and projects seeking to create social, environmental and animal welfare equity. For 23 years, her work as a director, organizer, and advocate focuses on effective, creative community solutions advancing social and environmental equity and sustainable resource development. Currently she is working with organizations addressing animal welfare, independent media, conservation of traditional ranches and farms, water quality and integrated healthcare. On Monday, August 26th in Santa Fe, the hearing will begin over a petition to weaken the New Mexico Mining Act Rules. Currently, all mines over ten acres must comply with comprehensive monitoring and environmental regulations. But a mining company wants a special favor for the humate mining industry: allow humate mines under 60 acres to dodge most of these environmental requirements. If the Mining Act Rules are amended to accommodate this mining company’s wishes, what is to stop all mining companies from getting the same thing? Come out and support one of New Mexico’s most important environmental laws! Full details on how to be involved further with the New Mexico Environmental Law Center’s action will be updated here by September 3rd. Stay tuned.